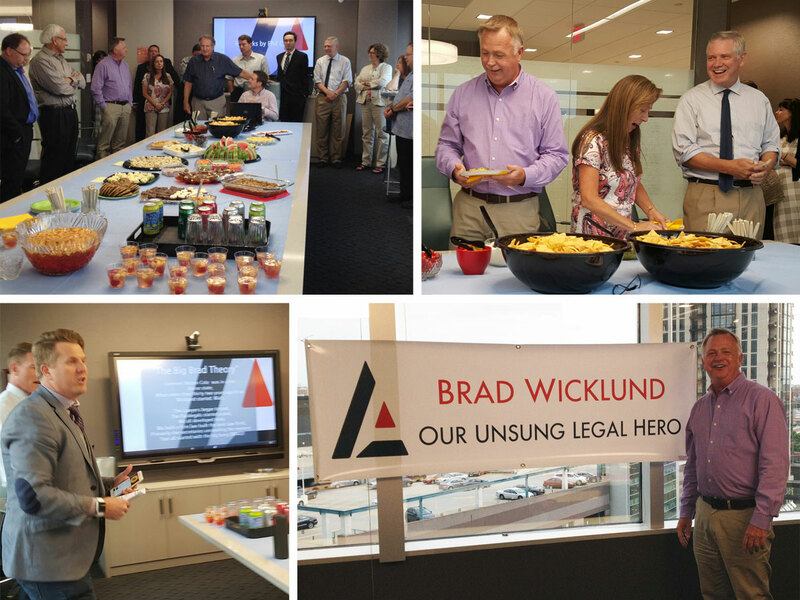 Brad Wicklund was honored by Minnesota Lawyer as an Unsung Legal Hero at a luncheon on September 10th. Read the article which appeared in Minnesota Lawyer. Brad is shown below receiving his award and with a group from Lommen Abdo which attended the event. Lommen Abdo also honored Brad at a surprise party on August 27th in our Minneapolis offices. Helping move the firm to a more paper-reduced office. Pulling off a fun, welcoming open house for connections of Lommen Abdo at a budget-loving bottom line. Brad takes care of several sets of “clients” – our true Lommen Abdo clients, our vendors and all of our attorneys, paralegals, support staff and administration. He has information ready at his fingertips whenever anyone needs it. Plus he coordinates the firm’s operations across offices in three separate states. Brad’s longevity here – 32 years – has helped Lommen Abdo be a firm where people come to work and stay for a lifetime. Brad’s presence has helped the firm build its great camaraderie and culture. Brad downplays his role in the firm’s success and works to make the firm and everyone else better. He is very deserving of this “Unsung Legal Hero” award.